Adults are oblong-oval insects that are brown in color with black eyes. They are 2-3 mm long (1/10”) and covered with short, stout, moderately dense hairs. Hairs on the wing covers are arranged in rows, giving the appearance of lines running lengthwise. They have slender antennae with the last three segments enlarged. Adults are capable of flight. Mature larvae are whitish to pale brown, 4-4.5 mm (1/6 in.) long. Darker projections at the tip of the abdomen are similar to those found on flour beetle larvae. 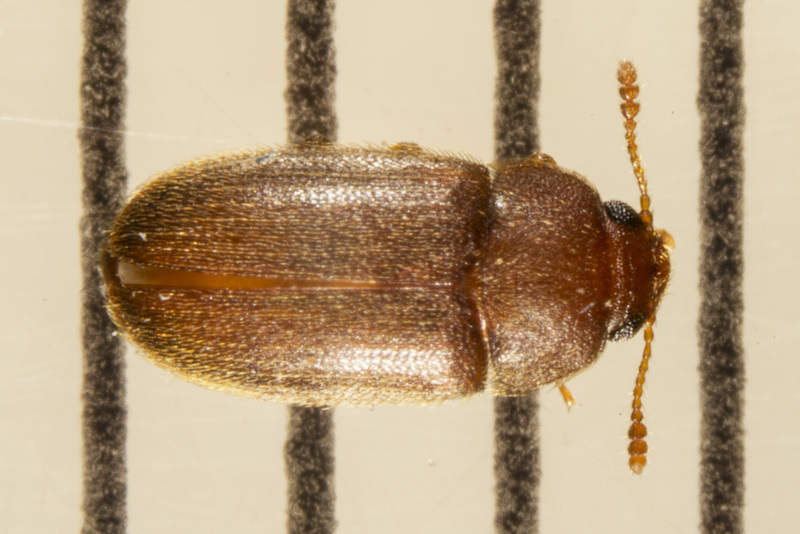 Hairy fungus beetles may be found indoors or outdoors in places where grains or other food products are stored under conditions favorable for mold to grow. This insect serves as an indicator that grains or other foods are too damp for safe storage and may be going out of condition. Adults may fly or crawl into railcars or food processing plants from moist moldy residues nearby. This species occurs on a wide variety of foodstuffs, including grains and cereal products. It is a scavenger that feeds primarily on molds. Hairy fungus beetles have been reared on pure cultures of certain molds commonly found in grains and are considered a good indicator of damp storage conditions.